This Holiday Season make someone else feel special. 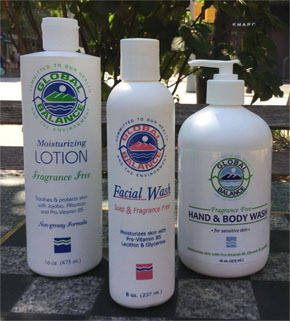 Send them a Feel Good Holiday Package, filled with gentle, non-toxic Global Balance body care products which are good for people and the earth. Introduce a friend to the world of aroma: Lavender, Geranium, Siberian Pine Needle, Patchouli, Lemongrass and Ylang Ylang for a clean, fresh, invigorating feeling. These products are not easily found at your local health food store, therefore making them unique gifts. 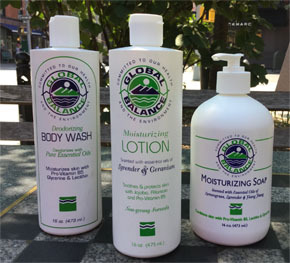 Global Balance Deodorizing Body Wash 16 oz. Global Balance Lavender Geranium Moisturizing Lotion 16 oz. Global Balance Lemongrass Moisturizing Soap 16 oz. Here’s all you have to do: Place the order on our website or by phone and we’ll do the rest. We’ll ship the order to the gift recipient with a card letting them know that the gift is from you. Let us know if you want to personalize the message. Let us know when you want the package to arrive. If you include the recipient’s email, we will notify them to expect a gift from you via Sunrise Lane. We will track the shipment from our end and inform you when the package has arrived. If you are sending the package to someone in Manhattan, we will deliver for free and we will not charge you for shipping.